Capable of removing 98% of impurities (heavy metals, dissolved solids, chlorine etc. ), it is little wonder how this product is the top rated RO system on Amazon. It incorporates larger tubing and fittings compared to traditional filters, thereby doubling the rate of water flow. Not only does it re-mineralize the water twice (to storage tank and water faucet respectively), Home Master Artesian also adds a small amount of calcium and magnesium to impart health to each sip. With 7 stages of water purification, the system has durable filters that can last a whole year and provide 2,500 gallons of pure water. Are you concerned about the purity of water your family consumes every day? 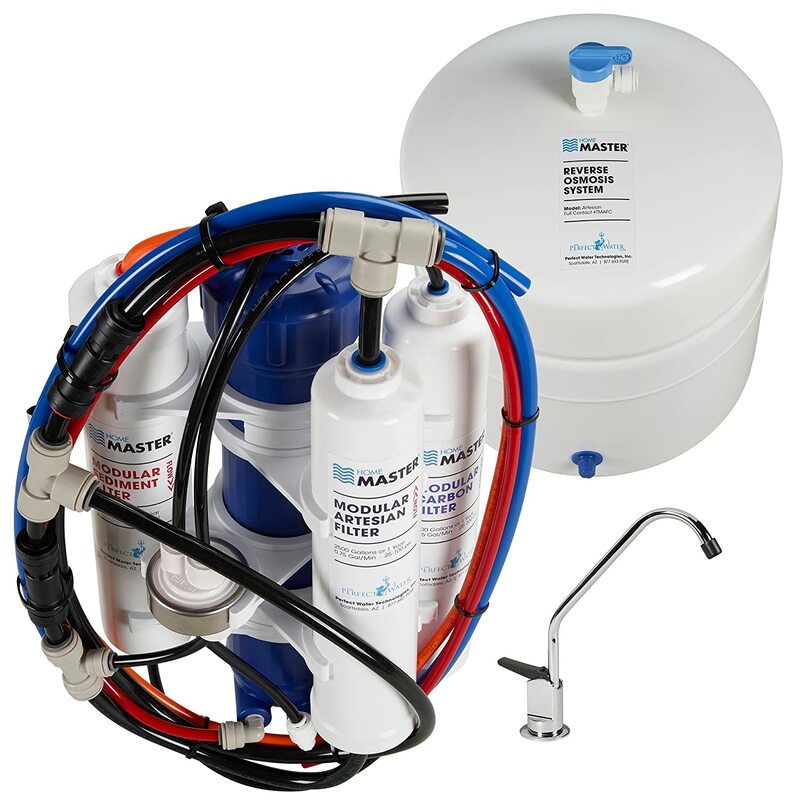 If so you might just want to try the Home Master TMAFC Artesian Full Contact Reverse Osmosis System. This innovative water purification system can be easily installed at your home to get great-tasting water that you can drink straight from the tap. The Home Master TMAFC Artesian Full Contact Reverse Osmosis System uses an exceptional seven stage filtration system to remove almost 98% chemicals and impurities to deliver pure, alkaline water from your faucet. Its ‘Full Contact’ feature adds calcium and magnesium twice by passing the water through the ‘Artesian Remineralization’ filter (similar to rainwater passing through the earth). This filtration provides your family with the goodness of tasty water fortified with minerals. Its revolutionary design eliminates problems commonly seen in most RO systems to date and ensures that water flows doubly fast from the tap. The modular filters of the Home Master TMAFC Artesian Full Contact Reverse Osmosis System are durable and leak-proof; you only need change them after purifying 2000 gallons, or after a year’s use. Installation is super quick; you just need to push it in. The filter is incorporated into its housing, so while replacing the filter, the entire thing is disposed. This reduces chances of under-sink leakage and eliminates the need to continue with the same filter. If the housing is not changed, the expensive ‘canister’ RO systems will get eroded and weakened over time, posing a threat of flooding and damage to your home. This product has a high rating of the popular shopping sites like EBay and Amazon, with customers giving it 4.8 out of 5 stars. Most consumers mentioned the ease of installation and a noticeably positive difference in the taste of water; they said they used it even for babies. The Home Master TMAFC Artesian Full Contact Reverse Osmosis System is a highly efficient, innovatively designed, easy to install. The system that ensures speedy delivery of tasty water that is not only devoid of harmful contaminants, but is also enriched with necessary minerals, making it the best water purification system you could have in your home. To purchase the Home Master TMAFC Artesian Full Contact Reverse Osmosis System, just click here ! !